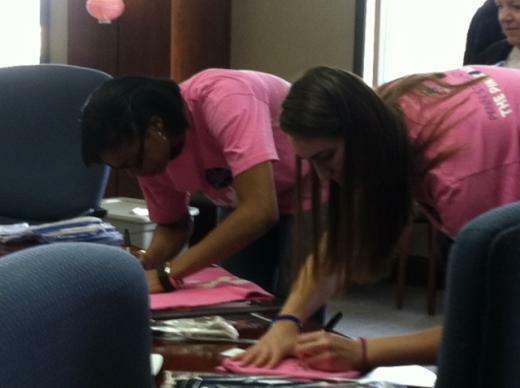 Lady Lions Ariel Edwards (left) and Tori Waldner sign T-Shirts and other items at Pink Out Day at Mount Nittany Medical Center on Thursday afternoon. Photo by Nate Mink, StateCollege.com. Fresh off their first Big Ten regular season championship in eight years, there's even more buzz surrounding the Lady Lions' Pink Zone game on Sunday. More than 10,000 tickets have been sold — the entire lower bowl of the Jordan Center is sold out — and that does not figure in walk-up sales, team spokeswoman Kris Petersen said Thursday at Mount Nittany Medical Center, where a pair of players and members of the coaching staff stopped by to sign give-away items and meet with hospital staff. Additionally, nearly 500 breast cancer survivors will be on hand and honored at halftime, another record number, Petersen said. No. 11 Penn State (22-5, 12-3 Big Ten) hosts Minnesota at 2 p.m. Big Ten Network will televise. Penn State was one of the pioneers when the WBCA Pink Zone took off. The Lady Lions were the first team to wear pink uniforms. Petersen quipped her friends called her at the time to make sure the color on their TVs wasn't messed up. The WBCA Pink Zone, annually one of the Lady Lions most popular schedule dates, raised almost $200,000 last year. Money raised this year will benefit Mount Nittany Medical Center, Penn State Hershey Cancer Institute, Pennsylvania Breast Cancer Coalition, the Kay Yow Cancer Fund, J.C. Blair Memorial Hospital and Lewistown Hospital. Thursday, sophomore forward Ariel Edwards and freshman forward Tori Waldner found time in their day to visit Mount Nittany Medical Center. Head coach Coquese Washington also was on hand for the event. A video with Washington is embedded below. Front and center at the Bryce Jordan Center last weekend, the imagery was strikingly familiar. Two dramatically oversized ribbons appeared as backdrops behind the main stage, new additions to the set-up at the Penn State Interfraternity Council/Panhellenic Dance Marathon.